A whole class of app crashes caused by typing or deleting characters in search fields using Qt QML components (such as in Discover and System Settings) was traced to a Qt bug–and KDE developer Aleix Pol has submitted a patch! There’s also been a ton of work in Discover, particularly in Snap and Flatpak support. You can read about it here. If any of this seems cool or useful, consider helping us out by becoming a KDE contributor yourself. If donating time isn’t your cup of tea, we always appreciate donations of money, too. We can’t do this without your support! Previous Post What about AppImage? I really like this kind of posts. Reminds me of commit-digest back in the days. Thanks, Martin! I intend to keep doing a new post every week. One way to help out would be to CC me on Bugzilla tickets or Phabricator revisions that you think are relevant to this effort and or that you’d like to have highlighted. I currently browse through these manually, but can miss things. Me too. @Nate: Please keep it up. And in fact, feel free to provide more technical details. For instance the stating of /etc/localtime was really interesting and may also be relevant for other developers. But since these details are not mentioned, this info is kind of lost to most developers. In any case, your work is pretty cool and very much appreciated (I am a KDE dev myself since 2004). It is always nice to see that contributions do make a big difference. Thanks! My intention is to keep this on the less technical side to maintain approachability, but I always link to the bug reports or Phabricator revisions so people who want to know all the technical details can dive in. Sometimes it helps to blog about such bugs as well to direct attention to it. Not a bad idea. Maybe I’ll do one per month, with a higher-level retrospective. Fantastic work by all involved! Love seeing usability improvements. Looking forward to future updates. Agreed with Nate. This kind of post is awesome. And this kind of _work_ is amazing as well. Polish and usability work is much needed. Very nice improvements, lot of small corrections but very useful. Very good job to all the KDE developers. Nice improvements! Thanks for the update. Wow, as a simple & dumb (bug looong term) user, I’m absolutely delighted. Those are stellar fixes / improvements beneficial for everyone. Just among this weekly list, there are several things that bogged me but that I couldn’t put my finger on. I’m so happy to hear that we’re making a difference! 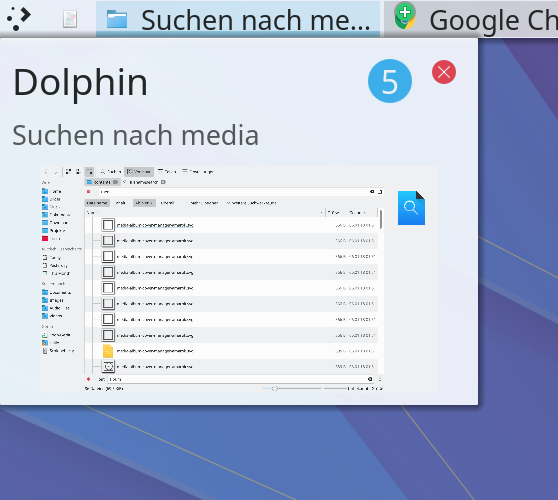 – Dolphin has the same 3 lines scroll speed, whether in list mode (which is normal) or in icons mode. But in icon mode, it means that a tick of the wheel scroll the whole screen, which is not correct behavior. For the panel pixel issue, do you have a hotcorner set up? How about a KWin screen edge? No hotcorner set up, and no KWin screen edge (BTW, I use OpenBox as a WM). In my screenshot, you can see at the bottom left a bit of blue of the background image, but you can see it also at the top of the taskbar, looking like the taskbar as minimal rounded corner (it’s hard to see the light blue against the white of the window above, zooming helps). What theme are you using? Is that standard Breeze and a standard panel, or are they something else? Does the problem go away if you temporarily switch back to KWin? Breeze Dark, with Breeze component. All standard. I don’t think I modified something I shouldn’t, but I may have missed something. I tried to switch to KWin to see if it changed something. It didn’t. Please add a comment in that bug and we’ll continue the triage there! That’s standard Breeze you’re looking at! It is pretty, isn’t it? I’m using breeze as well but my window decoration is blue instead of the dark gray. Maybe it is a Fedora modification of the theme. Well, I guess that’s the default KDE colour-scheme, it’s the same as Neon’s. Where can I learn to develop for KDE? I can’t stress enough how much this effort is needed and appreciated. Please continue the great work. Wonderful, I’m glad to hear you’re happy! Thanks for your great work! Attention to detail is really important and I’m really happy to see more of that attitude in the Linux community. You’re welcome! I completely agree. I've a question, what do you know about the patch fixing crashes caused by typing or deleting characters in search fields using Qt QML components (such as in Discover and System Settings)? This is the only problem that I have when using the new plasma, see you! Congrats for your work!!! Where possible, we are working around the problem you mention in our own apps. We’ve already fixed discover, and a patch for System Settings just went in today. But take a look at the Qt patch: it’s winding its way through the review process! Once it’s in, distros will have to either provide a new version of Qt, or cherry-pick the fix into their own version. Hello! This is my first time fileing a bug to KDE!!! My English problems discouraged me to do it, but well, here I am hahaha. Thank you for the PERFECT bug report! That’s a thorny Qt issue that we’re aware of. There’s a patch to fix Qt, but we’re trying to work around it on our side, too. Thanks for reporting it!